Stand on the middle of a band and raise your upper arms to shoulder height, wrists above your elbows. Step your feet out wide. Place one end of the band under your foot and hold the other end in your hand. Keep a slight bend in your el-bow as you raise your hand out to the side until your arm is at shoulder height and the band is taut. Slowly reverse. Repeat the motion for 10 reps total, then switch to your other hand. Hold one end of the band in each hand and step on to its middle. Keep a small distance between your hands as you pull the band upward in a straight line, making sure your elbows peak above your shoulders at the top. Extend your arms to return to the start. Repeat for 10 reps total. Choke up with each hand on either end of a band, or fold it in half to increase the ten-sion. Position both hands in front of your chest with elbows lifted. Extend from your elbows to open your arms out wide, keeping your elbows at the same height throughout the motion. Hold for one count, then return to the start. Do 12 reps total. Tuck one end of the band under your foot, grab the other end in one hand, and raise your elbow until it is beside your head. Place both of your feet beside each other on the middle of a band and hold one end in each hand. Soften your knees and lean forward from the hips until your back is 45 degrees to the ground. Leading with your elbows, pull your shoulder blades toward each other as you bring the handles up to the sides of your chest. Pause, then lower your hands back to the start. Repeat for 12 reps. Tie the ends of your band together and loop it around your calves. Without bend-ing your knee, raise one leg straight out the side. Keep your core strong to maintain a tall upper body. Pause, then reverse. Finish 10 reps on one side before switching to the other. Place your hands on your hips or keep them loose at your sides. 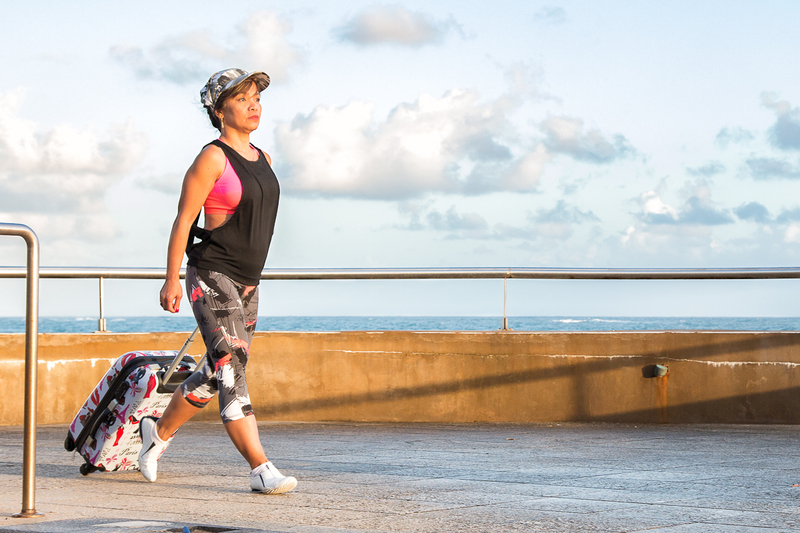 Take a big step forward with one foot and bend both legs, dropping your rear knee an inch or two above the ground. Pause, then press through your front foot to return to the start. Repeat, alternating legs, for 20 reps total. Sit on a bench or ledge with your feet flat on the ground. Place both hands beside your hips, walk your feet forward slightly, and extend your arms fully. Bend your arms to lower your glutes toward the ground. Keep your eyes facing forward and don’t let your elbows flare out to the sides. Press through your palms to extend your arms. Do as many reps as you can with good form. Loop the band around your legs and squat down low. Hold your hands together in front of your chest for balance. Keep your glutes low to the ground and shoulders level as you step one foot out to the side, then move the other to meet it. Continue moving in the same direction for 10 steps. Without stopping, move in the opposite direction back to the start. Get into a push-up position on a mat with your legs straight and your hands under your shoul-ders. Bend your elbows to lower your chest toward the ground. As you rise, reach one arm across your body to tap your opposite shoulder. Continue in this manner, alternating arms, for 16 to 20 reps total. Lie face-up on the ground with the middle of the band looped around the bottom of your feet. Grab one end in each hand and raise your shoulders and feet slightly from the ground. few inches above the ground. 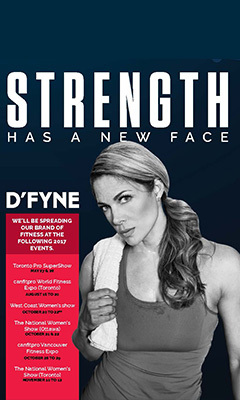 Complete 15 reps.
D’FYNE is the definitive health and fitness source for women 40-plus - the wives, the mothers, the independents, the business gurus, the young in body and mind - a source of health and fitness inspiration for women in their 40s, 50s, and beyond. Our promise is to present material that reflects your lifestyle, and to give you and your peers a deserved and much-lacking platform. © Copyright 2017-2019. DESC Publishing. All Rights Reserved. Thanks for visiting our website. We are new and building content as quickly as our muscles will let us grow. Check back weekly for updates. Please share our social media pages and subscribe to our magazine and be part of the group that flexes their muscles as we flex ours.